All children have equal access to the school and no one religion or worldview is given priority over another within the school. All children are encouraged to explore their full range of abilities and are provided with equal opportunities regardless of their gender or identity. Our child-centred approach means that we put children at the heart of all policies and practices and involve them in decision-making where appropriate. We run schools on a democratic basis, encouraging active participation by parents and students in the daily life of the school whilst positively affirming the professional role of the teachers. Educate Together is working towards an Ireland in which all people have access to an excellent education that is inclusive of all, irrespective of belief system, race, ethnicity, class, culture, gender, language, lifestyle and ability. 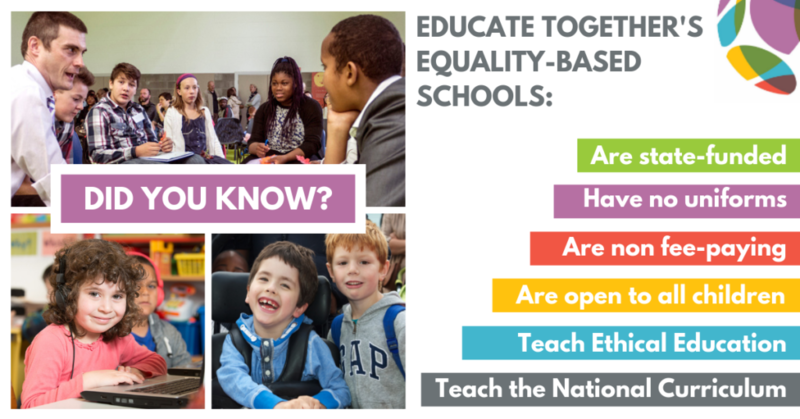 Educate Together is an agent for change in the Irish State education system seeking to ensure that parents have the choice of an education based on the inclusive intercultural values of respect for difference and justice and equality for all. In Educate Together schools, every child will learn in an inclusive, democratic, co-educational setting that is committed to enabling and supporting each child to achieve their full potential while at the same time preparing them to become caring and active members of a culturally diverse society. Brochure : What is an Educate Together National School?